Oxford Plains Speedway officially opened at Noon on Friday for the teams that are competing in Sunday’s TD Banknorth 250. Friday and Saturday are optional practice days at the track. The 250 is technically only a one-day show. Heat races don’t start until Sunday afternoon and teams will roll in all weekend to get set-up for the race. Others used Friday as a shake-down session. No official times were kept of the practice sessions, but pit area observers kept mentioning the #24 of Mike Rowe and the #29 of Scott Chubbuck as the quicker cars on the stop watch. The teams who were practicing on Friday saw quite an advantage to being on the track. Some teams got a head start on the weekend on Friday. Some did not. There are many schools of thought when it comes to preparing for the 250. 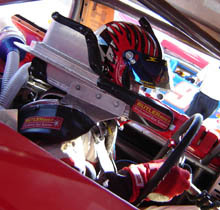 Some teams believe that practicing too much can lead to over engineering a car for the race. A few big names were missing from the Oxford pits on Friday. As of late afternoon, Ben Rowe and Johnny Clark were nowhere to be found. A few other teams came in to park their rigs, unload a bit of equipment and then go home. Some guys rented the track earlier in the week and went with the idea that there is no such thing as too much track time. Logging laps can also bring to light problems that could be disastrous on raceday. On Friday, Leperle took some hot laps with old tires and his rear end problems appeared to be solved. Patrick Leperle is happy that he came early with his #91. 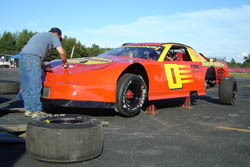 Several teams came to the track on Friday, but did not practice. Those drivers included Scott Mulkern and Sam Sessions. Sessions tested earlier this week at Oxford and is a surprise entrant in the 250. Over the winter, Sessions put his equipment up for sale. 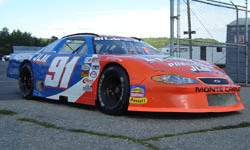 The 2003 Big Dawg 400 winner and former PASS champion appeared to be ready to make an exit from racing. But his car did not sell and having it sit around come 250 time made it tempting to come out and race. The temptation became irresistible two weeks ago when sponsorship was found for the race. After the 250 is over, the for sale sign will come right back on the #0. Another driver who has taken time off from racing who was roaming the pit area on Friday was Bill Penfold. The former NASCAR Busch North regular has parked his equipment this season, but given a little push he could show up for Sunday’s 250. Practice will continue along with an ACT Late Model event on Saturday at Oxford. Speed51.com will continue to have coverage throughout the weekend. The #0 of Sam Sessions was a surprise 250 entry.